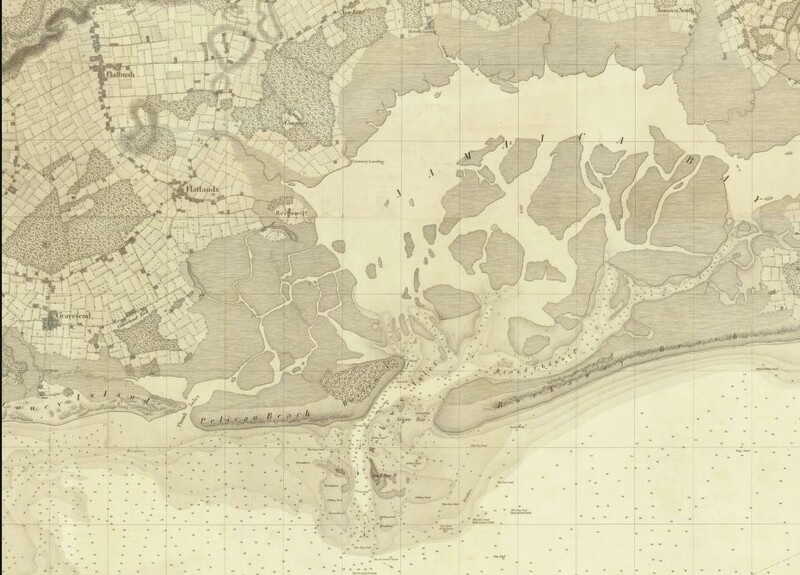 Jamaica Bay in 1844 – note the different location of the bay’s entrance channel (Coney Island is to the far left). Small specks are actually depth values – this was a large map and these are readable in the full-size version. There are no depths across the bulk of Jamaica Bay because it was too shallow at that time for anything but small boats. I’ve been busy trying to finish up a bunch of storm surge related research for the past few months, but occasionally speaking on various scientific panels and other public events. So, below I’m linking a few of these that people may find interesting and informative. First, I’ll mention that I’ll be at City Museum of New York next Tuesday, participating in the panel discussion “New York After The Storm: Tough Questions”, moderated by NY Times architecture critic Michael Kimmelman. Come see! Note that reservations are required. Click here to register online. For more information or to register by phone, please call 917-492-3395. Here is a very cool story on coastal adaptation options that was carried last week locally in the morning news on WNYC, relating to my long-time interest in wetlands and storm surges in Jamaica Bay. (Check out the great map tool! But note that it’s actually NOT the pristine Jamaica Bay, as there were already some major modifications by 1891, as shown in older maps like the one above). And here is a more detail-oriented panel discussion with some colleagues for a special session of the NY State Assembly Standing Committee on Environmental Conservation’s public hearing on Extreme Weather. I start at 0:51:50 into the session, but the entire session is very interesting (our panel ends at 2:06:00). This entry was posted in climate, opinion, weather and tagged assembly, barriers, environment, event, extreme, New York, Sandy, weather, wetlands. Bookmark the permalink.